Sport has long been high on the agenda in Cockfield, with the village having a football Club since before the Second World War. 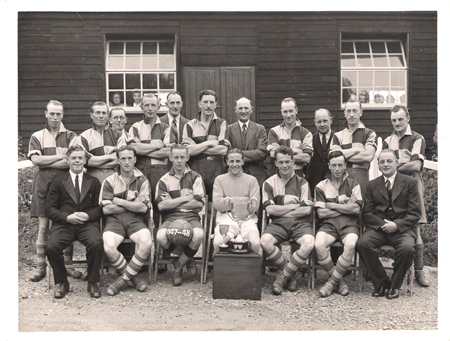 The earliest picture that we have on record is the season 1947/48 when Cockfield won the league trophy and were proudly pictured outside the old Village Hall. This was repeated the following season 1948/49. 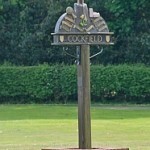 Cockfield were long standing members of the Bury and District League until 1999 when we joined the Suffolk and Ipswich League, rising to the senior division for a few years. The club were losing finalists in the Junior Cup in the 1999/2000 season but then were successful in 2002/03 when Framlingham were defeated 1-0 in the final at Ipswich. We were losing semi-finalists in the Suffolk Senior Cup in 2004/05. Football was previously played at other venues in the village according to legend, until settling to play on Great Green in the centre of the village. Great use is made of the pavilion that was built for the sporting activities of the village. Cockfield are represented by the First team and Reserves who play in the Division 2 and Division 4 respectively on Saturdays and, after a few years without Sunday football in the village, we are now represented in division 2 of the Bury and District Sunday league. The Sunday side were restarted in 2009 and were winners of the Suffolk County FA Sunday trophy in 2011/12. The village is also represented by a girls team who play in the Suffolk Girls and Women’s League which they proudly won 2011/12.